Hello Dr. Hitzig, thank you so much for your contributions to finding a cure for hair loss. From what ive heard about PRP alone is that it works best in the crown, okay in the mid scalp, and not so good in the hair line. My question is would Acell + Arterial Blood/PRP work just as well on the hairline as it does on the mid scalp and crown? We have seen results in all areas of the scalp. Very recent research indicates that MPB begins with DEFECTIVE STEM CELLS in the affected areas of the scalp. I believe that the combo works because we are injecting activated Adult Stem Cells into microwounds that we create with the injection needles thereby initiating a repair process that uses healthy uninjured stem cells to re-model the hair follicles. Time will tell but the early results are promising. » finding a cure for hair loss. » okay in the mid scalp, and not so good in the hair line. » hairline as it does on the mid scalp and crown? » early results are promising. Time won’t tell, good research that actually tests and proves this “hypothesis” (which sounds a lot more like guessing) will. Where are the double-blind studies? Interesting, and thanks for that Khalil! Dr. Cooley seems to contradict Dr. Cotsarelis direcetly. Dr. Cotsarelis says his research found that there are still stem cells all over the balding scalp, implying that these stem cells work well, and the only thing missing is the “dermal” cells. Dr. Cooley has given us a deeper level of understanding, i.e., that the stem cells are present, but they’re defective. All in all, I think Dr. Cooley understands this, or at least has explained this, better than Dr. Cotsarelis. » this, better than Dr. Cotsarelis. First of all, as clearly HEADLINED in the topic title, it was Dr. Gary Hitzig who responded to some questions. Dr. Cooley said nothing. HAIR FOLLICLE STEM CELLS ? Why do the following researchers harvest “STEM CELLS” from HAIR FOLLICLES and not from a slick BALD SCALP TISSUE ??? They presented their findings at the 6th World Congress for Hair Research in Australia, 6 month ago. The “Cots” study is - in my opinion - the biggest disgrace (or just misinterpreted hyped) I have ever heard/read. » misinterpreted hyped) I have ever heard/read. » » early results are promising. » Interesting, and thanks for that Khalil! » Dr. Cooley seems to contradict Dr. Cotsarelis direcetly. » only thing missing is the “dermal” cells. » stem cells are present, but they’re defective. The difference is Hitzig/Cooley are using an already FDA approved substance (Acell) … so they basically are free to experiment with it how ever they want. They are not beholden to a parent company that is going to need 5+ years of clinical trials to get approval for some kind of new procedure like Cotsarelis is. Hitzig/Cooley, can try something, see if what works and quickly tweak things pretty much as much as they want. » » this, better than Dr. Cotsarelis. » Hitzig who responded to some questions. Dr. Cooley said nothing. » - HAIR FOLLICLE STEM CELLS ? » HAIR FOLLICLES and not from a slick BALD SCALP TISSUE ??? » in Australia, 6 month ago. » cells and not ANY “stem cells” from the slick bald scalp, Mr.
Hey, fckrls, I think most of us here have a healthy respect for the scientific method, so no one’s arguing that, but your obsession with ‘authority documentation of results,’ as priorty over actual Experience of some innovative doctors is getting a little old. Bud, some of these doctors are ‘getting on with it’, and in this case, I, for one, like their attitude. But guys, maybe we shouldn’t be that hard on this guy. Could be he’ll one day, say around 2034 or thereabouts, be quiet famous. While the rest of us here are walking around with full heads of hair (hairloss corrected some twenty years prior) there’ll be poor fckrls, the only bald guy in NY, still waiting around for the paperwork. » waiting around for the paperwork. Actually, “the paperwork” (RELATED studies, who already confirm the science behind) is already written. It just needs a “summary” and same descriptions (protocol/material/methods) of the performed (different types of) procedures (including the observed results/discussion etc). That’s all. All good questions, Iron Man. I’m not arguing with you there. And sorry for assuming Cooley was associated with that. I agree, Costarelis’ studies are USUALLY a disgrace. 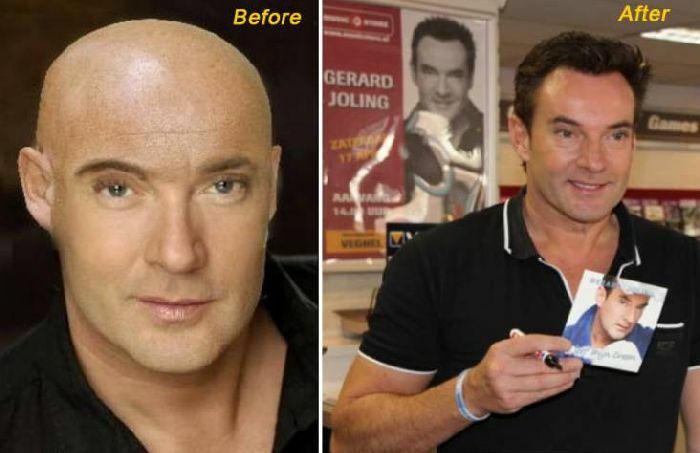 He is the biggest self-promoter in the hair loss research world! A self-promotion machine, who knows and taps the best media contacts every time he sees something “new” under his microscope, which is like every few weeks. The man has had the media in a frenzy about an imminent “cure” for MPB at least 5 or 6 times now. NOT fair to the general public and us hairloss sufferers! Clearly you have NO idea what the scientific method is, because you suckers jump on every false-cure that comes down the pike. How long have you been on this board? Ask some of the old-timers how many “cures” have come and gone. These “doctors” are making a lot of claims with little evidence. “Stem cells! Yeah! That’s it! Stem cells. Just mix some blood and throw in some pixie dust and, uh…STEM CELLS!” Where’s the peer-reviewed study? Where’s the hair count? All they offer is anecdotal evidence. You’re so desperate, you’ll believe anything, which is exactly why the hair-loss industry is a multi-billion dollar industry, despite offering little in the way of hair. All we need are pictures of five norwood 7 guys who turned into norwood 2. Until that day comes, its hard to believe in any breakthrough. » All we need are pictures of five norwood 7 guys who turned into norwood 2. Ok - now we just have to wait for 4 additional similar results. » » waiting around for the paperwork. » gone. These “doctors” are making a lot of claims with little evidence. » study? Where’s the hair count? All they offer is anecdotal evidence. » little in the way of hair. Fckhrls, I don’t think anyone disagrees with you that peer-reviewed studies are necessary before a breakthrough procedure (such as ACell used in conjunction with hair transplants) can be mass-marketed. However, those familiar with the scientific method also know that it takes time. It might be a year or two before the anecdotal claims made by Hitzig and Cooley can be substantiated by other doctors (for your edification, Dr. Rassman has already embarked upon a large, controlled clinical study that is in compliance with FDA protocols). Before that happens, it is not wrong for people to speculate about the positive benefits that might materialize as a result of this preliminary research. I personally don’t know why it bothers you to the extent that it does. Also, regarding the “scientific method” itself: What is this? Fifth grade biology? I think most of us have the capacity to understand basic academic jargon such as “experiment” and “hypothesis”. Just saying. » compliance with FDA protocols). That’s perfectly - that you mention this. But first, how do you know that? How do you know that Rassman has “embarked upon a large, controlled clinical study”? What means “large”? 5 trail subjects or 10,000 trail subjects? Similar to Rassman’s published FUE study (2002), does NOT mean that “FUE” neither did nor IS working as described in his FUE study today, because there’re always SO MANY VARIABLES involved in such studies and/or procedures or types of procedures. Did the for 30 min soaked in ACell plucked hairs from trail subject 03 grow better than the for just 5 min soaked in ACell plucked hairs from trail subject 07? And how about the results of bathing the plucked hairs for 2 or more hours? Bathing the plucked hairs in WHICH ACell combo? ACell mixed with saline solution? Or ACell+Lactated Ringer’s solution? Or did the procedure (which one/protocol exactly out of MANY varying?) worked better with a ACell+PRP combo? There are SO MANY (overlapping) factors & variables involved in just such a “transplanting of plucked hairs” procedure/clinical trail, so that the results/outcome finally just serves as “hint” or “where to start point” or simply just to give the reader a little “insight”. In my opinion, MANY small but perfectly described protocols/studies by different groups/doctors make more sense (as well as for more insight) than just 1 “large scale” trail by one group. » with a ACell+PRP combo? Dr. Hitzig: “We didn’t become experts overnight! As you are sure to see, the ones who “fail” in their so called Clinical Trials will be quick to blame the product, not the practitioner—Sad But True. This is just one of all the “factors” and “variables” I mentioned. Sure, because he is THE Dr. Rassman, a well-known Extracellular Matrix & Stem Cell EXPERT. So, Rassmann do not need any advise from ANY individuals, because HE is 1) THE Dr. Rassman and 2) the well-known ECM & Stem Cell EXPERT! The outcome of Dr. Rassman’s “Clinical ACell-Hair-Plucking-Study”, is almost WORTHLESS. "Now that more than one physician appeared to be having success with the procedure, Dr. John Cole, MD began a more in depth evaluation of the procedure. At the same time Dr. William Rassman, MD was promoting follicular unit extraction or FUE itself. Dr. William Rassman, MD and Dr. Robert Bernstein, MD practiced their version of FUE or follicular unit extraction for 1 ½ years before they presented their technique to the world. They delayed presentation so that they could collect their scientific data on their procedure. After their data was presented, we found that it was possible to successfully perform CIT® on many individuals who were FOX negative." » such as “experiment” and “hypothesis”. Just saying. Then why is it that every time some new “breakthrough” based on nothing but anecdotal evidence is heralded as a “cure?” You’re right - its basic 5th grade science, and it seems that there are quite a number of dropouts on this board. Acell is not a cure. PRP is not a cure. If EITHER of them did ANYTHING, their patents (is PRP patented?) would have been bought for a billion dollars and they would be in the middle of real trials right now, not being “tested” by HT docs. Histogen, Follica, and Aderans have legitimate potential, which is why the people behind those protocols have the backing to actually VERIFY their efficacy. There is something so suspicious about selling a product first, and proving its efficacy later. I wouldn’t knock PRP and Acell. At least some treatment options are being researched. They may not be cures but they probably have some potential as a treatment option even if growth is modest. If you shout down every honest attempt at research before the research even gets going, we will get nowhere. Its already ridiculous how FEW companies are actually researching a cure for MPB. Compare that to the search for a cure for cancer - thousands of major companies and researchers are involved and still they have not cured it!